What's Louise been up to? 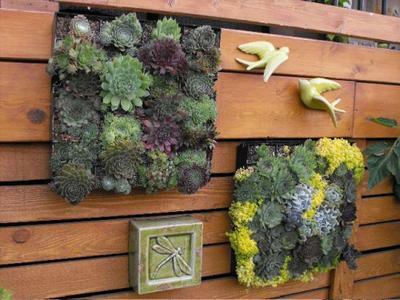 Louise is a good customer of mine, and she's got some wonderful ideas on how to use succulents of all kinds in her Alberta garden. If you're in a cold climate, don't despair - Louise's example will give you fresh hope that you too can have beautiful and innovative plantings. 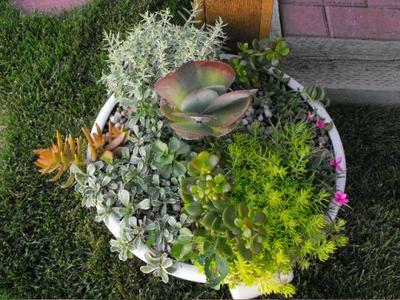 Many of these are tender succulents, but planted thickly and close together, they provide support for each other, and make a lovely grouping. Add a dash of some hardier succulents, like a bit of Sedum to drape over the edge, and a few darkest red Sempervivum, and you've got containers that will wow your visitors. 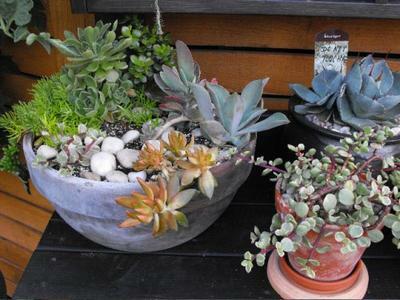 Take the idea of planting lush pots of gorgeous healthy succulents, find a bright sunny patio, and enjoy the view. Once colder weather approaches, you can take out the hardy Sedum and Sempervivum to overwinter outside, and move the rest indoors. Comments for What's Louise been up to? Forgot to mention that the bottom mosaic was a gift from our local greenhouse, did not plant that one. You're so welcome - and it's fabulous to see how you've used these great plants, and how healthy and happy they look - you are a good plant mommy! Louise you're a very talented Gardner. Louise, this is so beautiful. You are certainly a very talented gardener. Your garden is one of my favourite places to be. Love it!